"...spelunking in my nether regions..."? Kinda puts the d'bag slight into perspective, doesn't it? I also got a tetanus shot. OK, I'll bite (figuratively; why? No one just gest a tetanus shot - unless you were asked when you last had one and said, "Remember when some dude rolled away the stone...?" Nah, I was just due. I am totally ready to go step on rusty nails now. Okay, I guess after a week of no blogs, you are forgiven for handing us such a good one! That is hilarious. I can't believe somebody would actually take the time to find the paper and write that and think it would do any good. Or did somebody get that somewhere else and has just been holding on to it, waiting for the right time to 'pay it forward' and pass it along to someone else. There doesn't seem any reason for it to be on your car based on the picture but who knows how many other cars came and went while you were in your appt? You can't make this stuff up....life is just too unpredictable. Hey, are the Trojan robots going to the 'World Championships' in Missouri at the end of the month? MMR went crazy to raise money this week after their win in the Toronto Regional last weekend. I"m hearing that they found it and am just waiting for the note home that says how much each kid needs to be part of the trip. "I do not know what transpired in that parking lot while my doctor was spelunking..."
This shows a shocking lack of knowledge of what consumes a trained professional's day(s). Although wikipedia defines spelunking as (and I am quoting here...) "the recreational pastime of exploring wild (generally non-commercial) cave systems." Recreational? I think not. Wild cave systems? I suppose that would have to be an opinion left to a trained professional. And I do not feel qualified to comment. Did they find any stalagmites in your wild cave system? That tetanus shot will come in handy while building a deck. Everyone seems more interested in sperlunking, so I'll say it... parking job looked fine! By the way, I use the same doctor's office. I usually park in the diagonal spots on the other side and leave the ones in front for seniors. This was by someone who saw you go in. 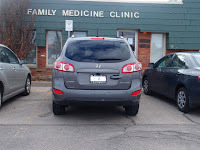 How your car is parked when you took the picture isn't relevant. A lot of time passed by then. How it was when you went in the office would probably reveal who wrote it. Obviously the medical car was the culprit. The guy had no class or patience. That was fun. I think I will drive down to Florida and see how many people see my car and ding it. Happens lots here. A new one on my rear bumper. it looks like it was cause by a license plate bolt smacking me rear. Talk to y'all (practing my American accent)in a couple of weeks. Christopher just heard me talking on the phone to Roz about this whole douchebag parking note. He looked up and said 'that note has been on there for three days. Me and Pam got it at the mall'. Uhm, what? He said some doofus in a Smart car left in on windshield. He said the idiot had tons of room. I tend to agree with this; I've driven Smarties. You can park them inside a thimble and have room to get out. I asked why he left the note on the windshield. He shrugged. I asked why he read the note and put it back on the windshield. He shrugged again. Well, at least this solves the mystery. 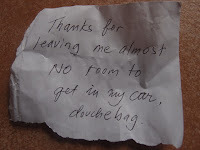 But someone is still pretty turdish for putting a rude note like that on a car. Not polite, not Smart. I mean, have they seen how big Christopher is? What I don't get is how you drove around with it on your car and you didn't notice it. And, I'll hold my comments on your spellunking adventure. C'mon... wade in. sis! You know that you're dying to! She is aware this a battle she will enter into at her own risk. I have to side with Rozetta Stone on this one. How did you drive around for 3 days and not notice the note (three words out of four with the root of "not." You can't not notice.) "I sat for a moment, and considered my detective skills." I think you may have wasted your time. Nancy Drew never had kids so i'm guessing this didn't ever happen to her. I don't think I've driven the car this week. I had the Fiat till Monday. Wait. I drove to my tango lesson. But you could only see the note from the front of the windshield, passenger side, outside. It slopes so inside you couldn't see it. Plus I've had a migraine for 3 days. And did I mention the tango lessons? 2. just how small is the doctor? methinks she sounds a little defensive. and I also think you may owe an apology to the older Slavic men out there with cheap pens. No. My detective skills hold. Christer didn't see who left it. I only have to alter that to older, Slavic man with a cheap pen...who drives a Smart car. Must be thousands of them out there. Buzz: I never had douchebag status. Someone called me one, but that doesn't make me one. Trust me; in the comments on the Globe site for my column today, someone said my writing was the worst he'd ever seen, painful to read, and like a grade nine student. So, even though the Globe calls me a writer, that doesn't mean I am one. I'm going to call this The Douchebag Theory from now on. And I never said you had douchebag status...that was Padraig. I did say whoever wrote it had no class. Oops! Sorry! I get muddled up sometimes typing in this little box thing. Padraig did it!! It was Padraig!!! And my words are Arliel Latillg. I think I went to high school with her. It's cuz I said 'Slavic'. That reminds me. I need Arlene to make perogies. Um, did the Dr. wear one of those helmets with a light on it?